TREE Neighborhood : Almost Complete! While it’s been a long journey, we’re excited that construction of the Third Residential EcoVillage Experience (TREE) will soon be finished. The earliest conversations about starting a third neighborhood at EcoVillage Ithaca (EVI) first took place in 2007. In 2008, a worldwide economic crisis cut into the group’s plans severely. Half of the TREE group dropped out, due to economic constraints. Now, seven years later, the 40 unit cohousing cluster is almost complete. Twenty-five houses have been occupied for the last year or two. One more building – a four story Common House with 15 apartments – is undergoing final inspections. 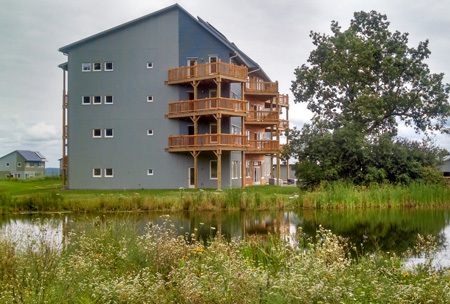 If all goes well, the “TREE House” as it is sometimes called, also known as “The Sustainable Living Center” (SLC), will welcome its first residents next month. This is a very exciting time, as it fulfills the dream of creating three cohousing communities, a total of 100 homes, at EVI. The three neighborhoods of EVI are part of the steadily growing cohousing movement in the U.S., which now claims 135 completed projects. With the completion of TREE, EVI will comprise the largest cohousing village in the world. One other village in Denmark has a total of 80 homes, clustered into four neighborhoods. Growing a village of this size is not without growth pains. Residents of the first two neighborhoods are used to a quieter existence, and it can be hard to get to know 40 new families, as well as figure out how to make decisions with a larger group. However, the staggered nature of the move-ins over the past several years has also meant that many TREE families are now well integrated into village affairs. Of course the children and pets lead the way, helping established and new families to get to know each other better. From the beginning, TREE has had three goals: affordability, accessibility and sustainability. These goals have sometimes competed with each other, such as when adding green features costs more. TREE members have tried very hard to meet each of the goals and have been quite successful in many ways. Affordability has been addressed in a number of ways: designing the neighborhood as one project, with three standard house designs and three standard apartments. Kitchens and bathrooms remain similar in all homes, and building materials have been bought in quantity. This allowed TREE to negotiate with suppliers. For instance, TREE bought extremely high quality windows from the German company Intus at a 10% discount for the whole project. Care was taken to use standard construction techniques, while layering in extra green features, such as super-insulated walls and air-tight building shells. TREE also developed some very small units, such as studio and one-bedroom apartments which are priced very reasonably. Also duplex houses are less expensive to build, and are priced to be more affordable. Finally, Mike and Kendall Carpenter, TREE construction managers, have been able to bring in the house construction costs at just $100 per square foot for the buildings themselves – a remarkably low number. As one visiting architect mentioned, I am staggered at the quality you have been able to achieve, especially considering the construction costs that you were kind enough to share with us. Despite all of this effort, TREE’s construction cost overruns have been difficult for many households to absorb. This has led some generous TREE members to create several TREE Working Investment Groups, or “TWIGs” which help lower-income members stay in the group. Accessibility was important to TREE, since many TREE members are in their 60’s and 70’s and want to continue to age in place. The other two EVI neighborhoods are not well-designed for people with mobility concerns. Eighty percent of the houses and apartments in TREE are accessible for someone in a wheelchair. They include an accessible kitchen, bedroom, full bath and living room on one floor. Sustainability was also a key goal. Here TREE really shines. All of the homes are certified as LEED Platinum, the highest building code designation in the U.S. In addition, 7 homes to date are certified as Passive House, (out of 82 certified in the entire U.S.) Passive House design hails from Germany, and includes extremely well-insulated walls, with air-tight building shells, and fresh air ventilation through an Energy Recovery Ventilator (ERV.) These homes are built to reduce energy use by 85% compared to newly constructed homes built to code. In addition, two homes are now proven to be Net Zero Energy, meaning they produce more energy than they use, year-round. 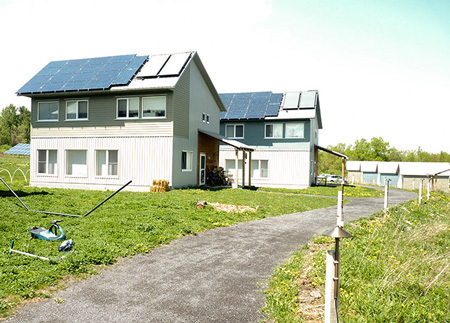 These are homes with solar electric and solar hot water panels. To be Net-Zero in this cold Northeast climate is a huge accomplishment that involves not only how the home is constructed but also how the residents use energy. Once the 15 new TREE households move into their apartments, everyone will celebrate. This is a huge milestone!